Major active players in sports medicine market are Stryker Corporation, Smith & Nephew Plc, Arthrex, Inc., Johnson & Johnson (Depuy Mitek), Zimmer Biomet Holdings, Inc., Conmed Corporation, Mueller Sports Medicine, Inc., Breg, Inc., Wright Medical Group N.V., and DJO Global, Inc. These players are set to power the sports medicine market in the years to come. 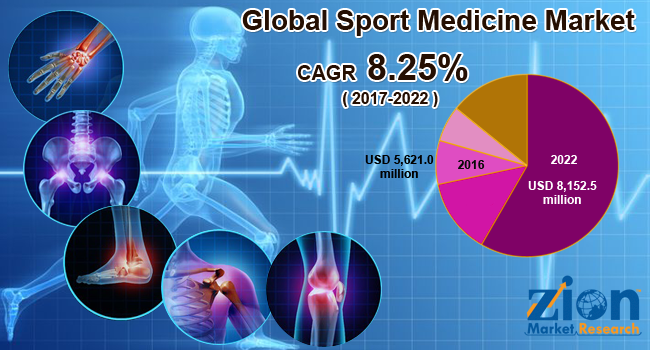 According to the experts at Zion Market Research, the global sports medicine market added up for almost USD 5,621.0 Million in 2016 and is likely to cross almost USD 8,152.5 Million by end of 2022, developing at a CAGR of almost 8.25% from 2017 to 2022. New product launches and technological advancement are likely to have a positive impact on regional demand of the sports medicine market. Hence, rising requirement owing to the increasing incidence of sports injuries is the major reason for boosting the development of the sports medicine market. Furthermore, government programs for the sports sector are incessantly accountable for the development of sports medicine market. On the other hand, the high price of goods might hamper the development of the sports medicine market. Nevertheless, changing regulatory scenario, untapped market, and various M&A by major players are likely to unlock new avenues for sports medicine market in years to come. For example, in May 2017, AlloSource and Stryker declared partnership to distribute biologics for employment in sports medicine processes. In addition to this, in September 2016, Stryker’s Endoscopy unit purchased Ivy Sports Medicine, LLC, strengthening its position in the sports medicine market. On the basis of product type, the sports medicine market has been divided into body support & recovery, reconstruction products, and accessories. The sports medicine market is further divided by body reconstruction products type into the fracture, implants, ligament repair machines, prosthetic devices, arthroscopy devices, and orthobiologics. On the basis of body support & recovery, the sports medicine market is further bifurcated as compression clothing, braces and support, and physiotherapy. Body reconstruction products sector ruled the sports medicine market with the majority of market share in 2017. In the near future, body reconstruction products sector is likely to show noticeable development owing to rising incident rate of sports wounds. On the basis of application type, the sports medicine market is divided as ankle & foot injuries, shoulder injuries, back & spine injuries, elbow & wrist injuries, knee injuries, hip & groin injuries, and other injuries. Knee Injuries sector grabs the biggest share of the sports medicine market. Owing to increasing occurrence rate of sports knee injury, knee injuries sector is likely to create new avenues for the sports medicine market.